Displaying 1-31 of 31 items. 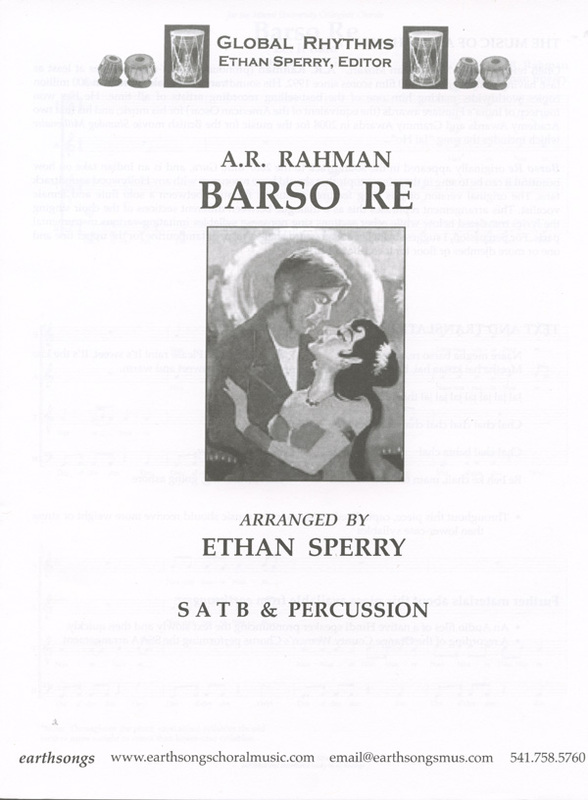 Barso Re, written by A. R. Rahman and arranged for choir by Ethan Sperry, appeared in the soundtrack of the 2007 film Guru. It is an Indian take on how beautiful it can be to sing in the rain. For percussion, use a beaded gourd shaker, rasp, or tambourine for the upper line and one or more djembes or floor toms for the lower line. Furusato presents five evocative arrangements of Japanese songs. Each poem depicts the beauty of the Japanese landscape, and familiar melodies and Chilcott's original style combine to create an enchanting fusion of East and West. 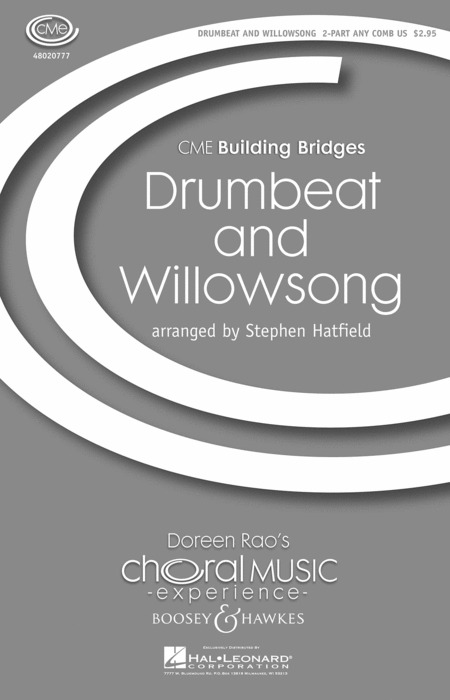 Suitable for performance as a suite or as stand-alone pieces, these charming and emotive songs will be a welcome addition to the repertoire of any choir. Following the success of the mixed-voice edition of Furusato, Bob Chilcott has adapted his arrangements of five evocative Japanese songs for upper voices. Each poem depicts the beauty of the Japanese landscape, and familiar melodies combine with Chilcott's original style to create an enchanting fusion of East and West. 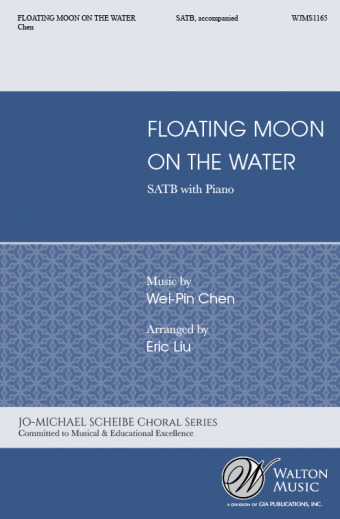 Suitable for performance as a suite or as stand-alone pieces, these charming and emotive songs will be a welcome addition to the repertoire of any upper-voice choir. An all a cappella collection of folk songs from a land where singing is second nature to most of it's inhabitants! Traditional folk song "Rosas Pandan" is a song of joy and love. George Hernandez, conductor of the Saringhimig Singers from San Francisco has captured the native Visayan flavor in this rousing and playful arrangement "Caturog Na, Nonoy" is a beautiful lullaby which features an alto solo accompanied by the choir. The joyful, Filipino Christmas Carol "Pasko Na Naman!" is a welcome addition to the season. 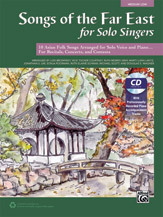 George Hernandez, has masterfully arranged a simple SATB, a cappella setting that simply works!. High school, college and community choirs will love this piece. "Ay, Ay, Ay, O Pag-Ibig!" is a fun and lively arrangement of a traditional Tagalog folksong. Includes pronunciation and translation notes. "Paruparon Bukid" (The Field Butterfly) is a humorous song comparing a butterfly to a Filipina dressed in her glamourous formal dress with tall butterfly sleeves as she moves down the aisle of the church, swaying her hips as every one looks on. With many influences including Traditional Korean music, Impressionists, and Anglican church music, Jisoo Kim writes in an eclectic style that is hard to pin down. These arrangements have become very popular and have been performed by the LA Master Chorale. Includes a Korean pronunciation guide. Songlist: Hangangsu taryeong (Han River Folk Song), Shingosan taryeong (Shingo Mountain Folk Song), Gyeongbokkung taryeong (Gyeongbok Palace Folk Song). A collection of Haiku Kai. Commissioned for the 2002 World Choral Symposium, May Sky is based on haiku written by Japanese and Japanese-American detainees in camps in the American West. Mike Brewer's Choral World Tour brings together traditional songs from around the world in exciting a cappella arrangements that will both challenge and stimulate your choir. Each piece is accompanied by a translation and pronunciation guide. 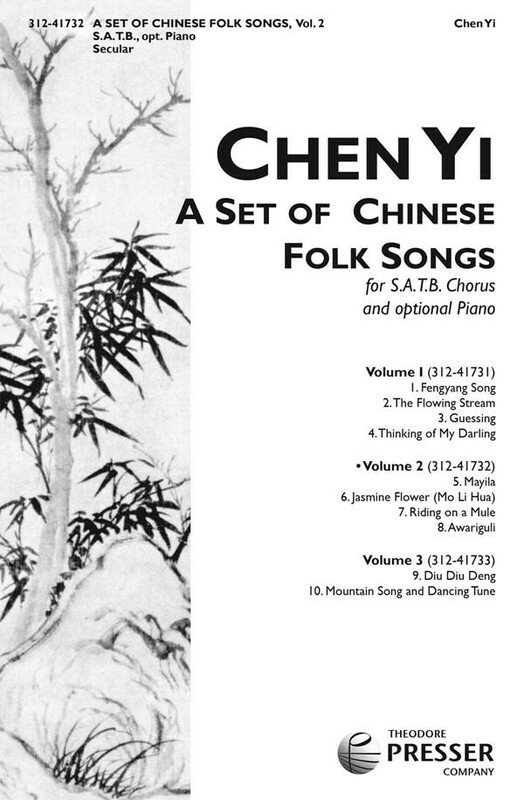 In this collection, feel the warmth of a Maori love song, experience intricate pentatonic part-song from China, and incorporate Bengalese percussion into your performance. The Six Seasons for unaccompanied choir was specially written for the Paranjoti Academy Chorus and conductor Coomi Wadia and is based on 11th century Sanskrit texts which were translated into Hindi by Vasant Dev. Each piece of the Six Seasons is based on a rag traditionally associated with that particular season. The composer ensures that each voice sings the rag itself, with no voice playing a subsidiary role. The tal or rhythmic cycle, which is an important characteristic of Hidustani classical music, is very evident with the composer indicating the commencement of every cycle with an "X." "Tatlo Sa Buhay" (Three Philippine Songs on Life) consists of a children's song, a lullaby, and a love song, this collection of folk tunes is full of lively rhythms and enchanting melodies. "Paruparong Bukid" - The Field Butterfly is a humorous song about the alikeness of a field butterfly to a 1900 Filipino lady dressed in her glamorous formal dress with tall butterfly sleeves. She struts swaying her hips down the aisle of the church as everyone looks on. 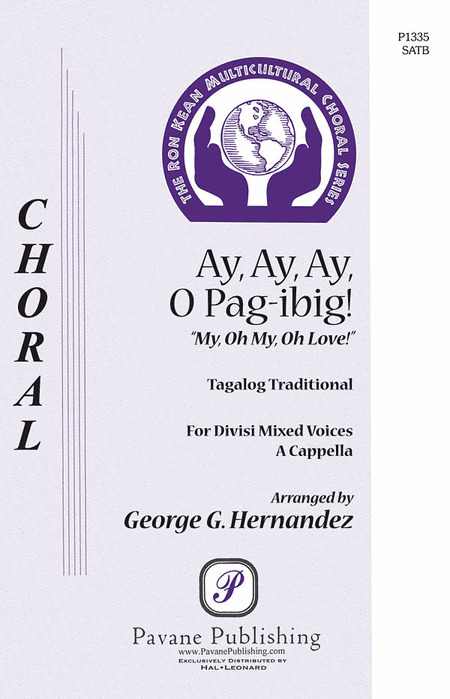 The Filipino choral arrangements that George Hernandez has written are some of the most popular in the Pavane catalog. Also available in SATB divisi, P1364. For high school and college treble choirs. Medium difficulty. "Rosas Pandan" - This Filipino or Visayan folk song is about joy and love. George Hernandez, conductor of the Saringhimig Singers from San Francisco has captured the native flavor in this rousing arrangement. Selected for the Ron Kean Multicultural series, high school and college choirs will love it. "Halina't Umawit Sa Panginoon" - Begins gently but soon breaks into a dynamic and pulsating hallelujah section that is captivating. Treble choirs of all ages, medium difficulty. 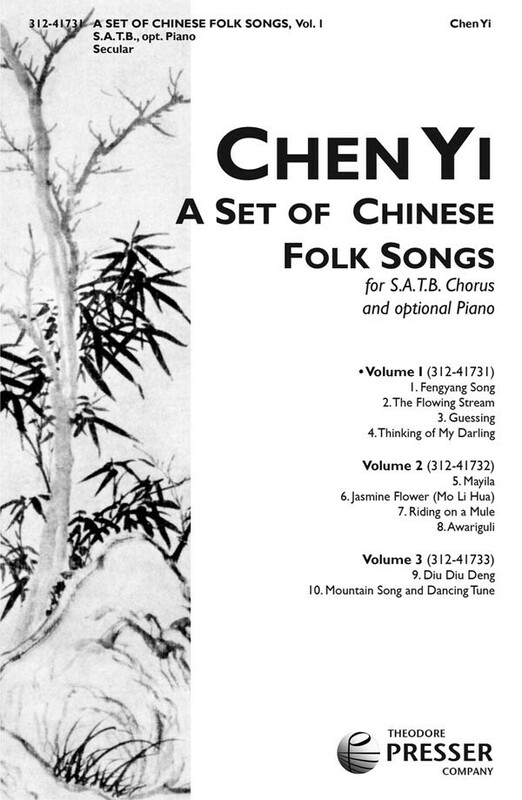 This exquisite collection of vocal solos features folk songs from China, Japan, Korea, Malaysia, Taiwan, and Thailand. Appropriate for both developing singers and mature vocalists, each of the ten beautiful arrangements is sung largely in English and a phonetic pronunciation guide is included for the phrases in Asian languages. The exuberant arrangement of an Eastern Inner Mongolian folk song "Dorven Dalai' exhorts everyone from the Four Seas (the "four corners of the earth" or all nations) to fill their wine bowls with the best of wine, to rejoice and sing and enjoy this moment of happiness together. "Naiman Sharag" - Mongolian songs often praise horses, real and legendary, reflecting the close relationship between horses and humans. A 13th century chronicle refers to the eight chestnut horses of Chinggis Khan, and they have thus become a symbol of national identity which embodies the Mongol's love for their native language and culture. Indigenous Mongolian musical rhythms are often patterned after the rhythm of a running horse. Such rhythms represent one of the major ethnic features of Mongolian music, and can be found throughout this piece. "Zeregleent Gobi" was written for the Inner Mongolian Youth Chorus Troupe and "Bless Us, O God" is an a cappella setting of a Mongolian prayer. Chua-ay is based on a popular folksong in the Philippines that depicts the Igorot tribes at work, pounding rice by means of a huge mortar and heavily weighted posts in order to separate the rice grains from their outer shells or husks. 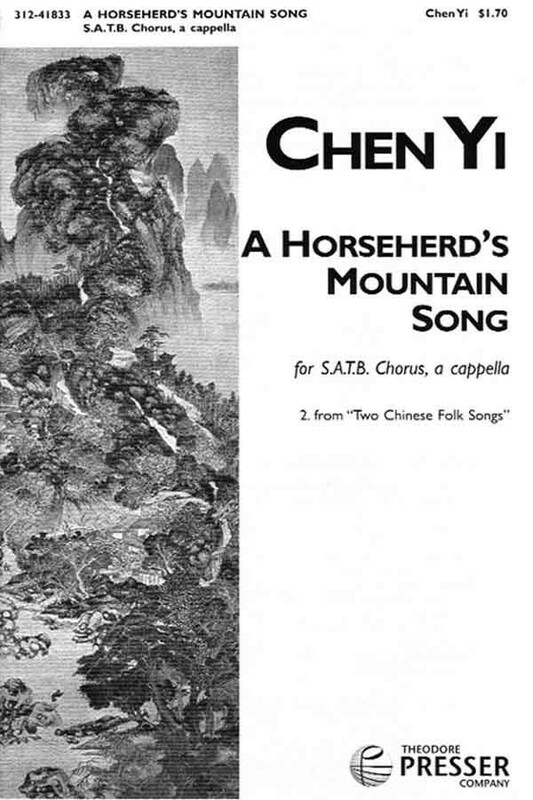 The piece begins with bird-calls serenely chanted by two sopranos and followed by a set of rhythmic vari- ations on the repetitive three-note theme of Chua-ay. Foot stomps suggest the mortar and pestle action that also enhances the earthy character of this northern folksong. Leron, Leron sinta or "My Dear, Little Leron," is a popular Filipino folk song from the Tagalog region. It is traditionally a work song, reprsenting those who work in the fields harvesting fruits, though the origin is unclear due to the lack of scholarly literature that examines Philippine folk music. 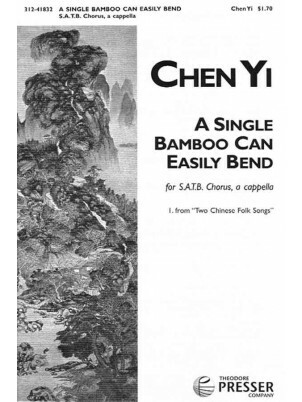 Because of its catchy tune, it is often presented as a children's song, though some parts of the text may have been meant for a more mature audience. Some sources also refer to it as a courtship song. "Ilay Gandangan" is a popular piece among Filipino choirs. Derived from a sun chant of the Maguindanao tribe, the people call on the sun god, Ilay, to end the rain that is covering the land. Haiku is a Japanese form of poetry comprised of three lines of five, seven, and five syllables. Jerry Estes has crafted a set of four short pieces set to original haiku... one for each season of the year. All are beautiful in their simplicity. 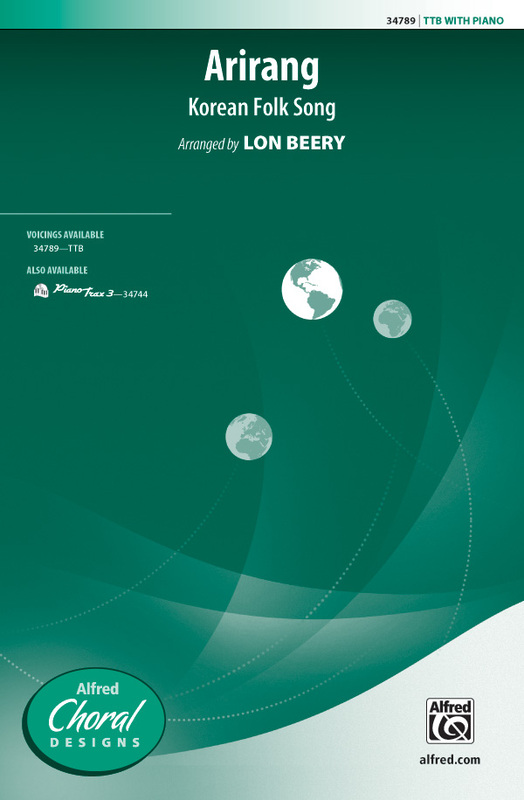 Well suited for Orff accompaniment; bells and rhythm instrument parts are included in the publication. An outstanding learning and performing piece for 2-part choirs. A delicate melody swirls and twirls like drifting snow in this tasteful arrangement of a traditional Japanese school song "Yuki". The three short Japanese phrases (and several English words) are easy-to-learn and bring to mind icy images of wintertime. "Uji River" is the most unique multicultural piece you will sing this year. A primarily English text tells the spectacular story of an ancient Japanese fishing tradition on the Uji River. 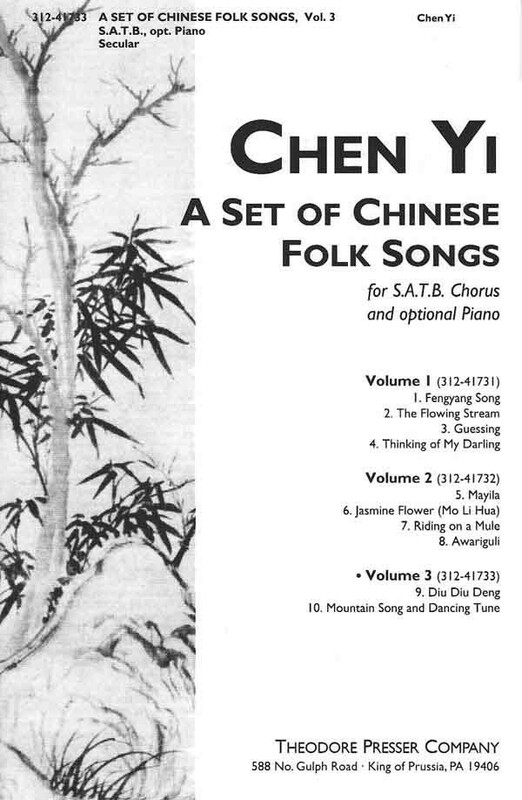 And a traditional Asian folk melody floats above a gentle koto-like piano. Magical for treble voices, and highly effective when TB singers sound like fishermen. Tsuki means "moon," and is one of just a few Japanese words sung in this pentatonic scale-based song. Other words describe the beauty of the Japanese moon throughout the year. A captivating and memorable piece. "Toshima Mochi Tsuki Bushi" is a Japanese folk song from Tokyo-To (Tokyo District). It is celebratory in nature, and implies that it might be sung as a work song while pounding rice into rice balls (mochi). The making of mochi is a collaborative family activity associated with the new year. Comprised of a children's song, a lullaby, and a love song, this collection of Filipino folk tunes is full of lively rhythms and enchanting melodies. Displaying 1-50 of 149 items. Your singers will enjoy learning this song from India that celebrates the Diwali Festival of Lights. It is in the Konkani language, which is the official language of the Indian state of Goa. Learn the pronunciation on the VoiceTrax CD or sing with the alternate English text. 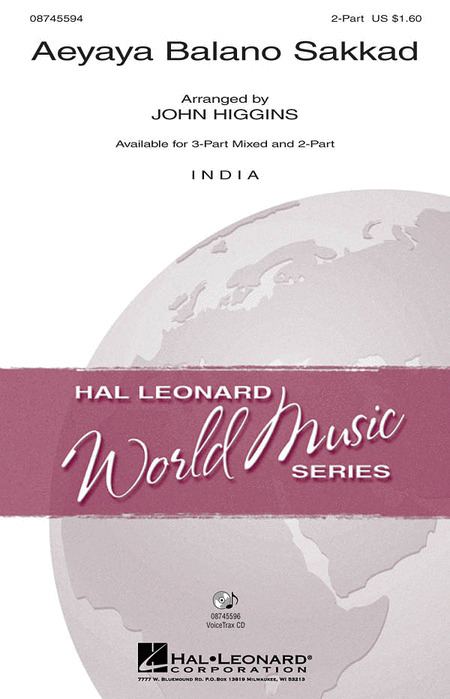 The authentic sitar and tabla sounds on the recorded accompaniment give this selection special appeal. Performance Time: Approx. 2:20. A stunning arrangement of the popular Korean folk song that speaks of Ahrirang Hill outside of Seoul, believed to be a symbol of personal contentment and triumph. This setting captures the style of Korean music, which is highly personal and tender, with sentiments of love and peace. 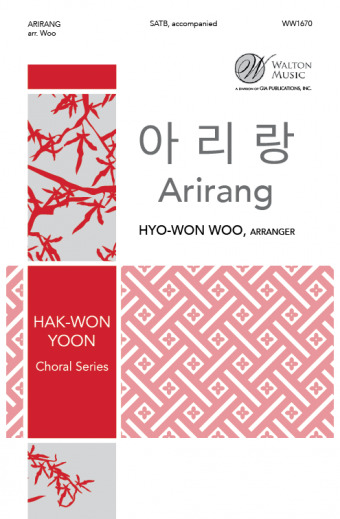 It also seeks to illustrate the contrast between Korean and Western music, with the middle section purposely arranged using common Western chords and harmonies. The canonic nature of the modal melody presents an excellent opportunity to develop independent part-singing. A bestseller in a new voicing! 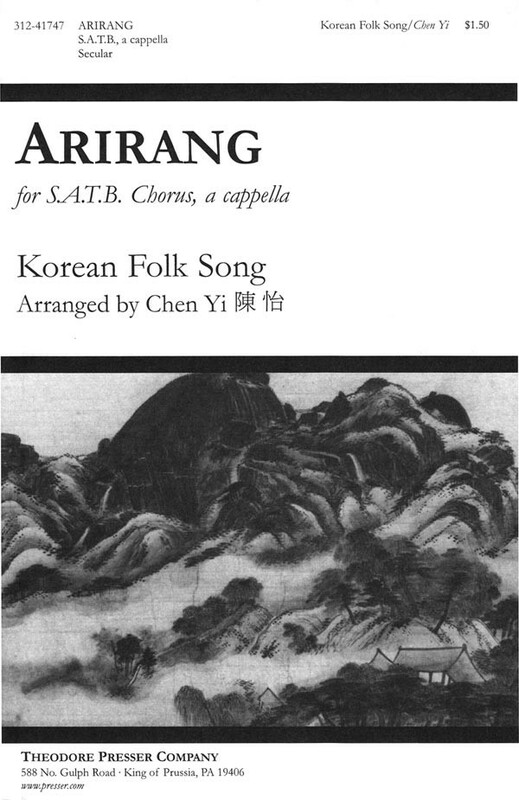 This stunning arrangement of the popular Korean folk song speaks of Ahrirang Hill outside of Seoul, a location believed to be a symbol of personal contentment and triumph. Capturing the style of Korean music, which is highly personal and tender with sentiments of love and peace, this arrangement also illustrates the contrast between Korean and Western music, with the middle section purposely crafted using common Western chords and harmonies. The canonic nature of the modal melody presents an excellent opportunity to develop independent part singing. A beautiful traditional Japanese folk song, Akatonbo's memorable melody sings of dragonflies in varying ways: unison, canon, accompanied, and a cappella. Gorgeous for both women's and upper elementay choirs. The music of Asia needs to be a part of your cross-cultural musical experiences, and this Korean folk song is an excellent choice. The melody is one of the most popular of all Asian folk songs and for good reason: it's beautiful. Sonja Poorman's arrangement includes an easy, flowing piano part and an optional flute. The first verse may be sung in Korean (pronunciation guide included). Tender, expressive singing for changed and changing male voices. This setting of the familiar pentatonic folk melody is a standout, honoring the beauty of its origin while adding a contemporary touch. Accompaniment available on PianoTrax 3 CD (00-34744). Ruth's captivating setting truly captures the distinctly Asian flavor of this ancient Japanese text with its haunting melody and simple harmonies, featuring open fourths and fifths. The Japanese lyrics, which alternate with the English translation, are easily learned, and both a pronunciation guide and translation are included. Reminiscent of her best-selling "In This Ancient House" (15/2407H), you won't want your singers to miss experiencing this creative-programming, multicultural gem! George Hernandez : Ay, Ay, Ay, O Pag-Ibig! From the Ron Kean multicultural series, this fun and lively arrangement of a traditional Tagalog folksong includes pronunciation and translation notes. 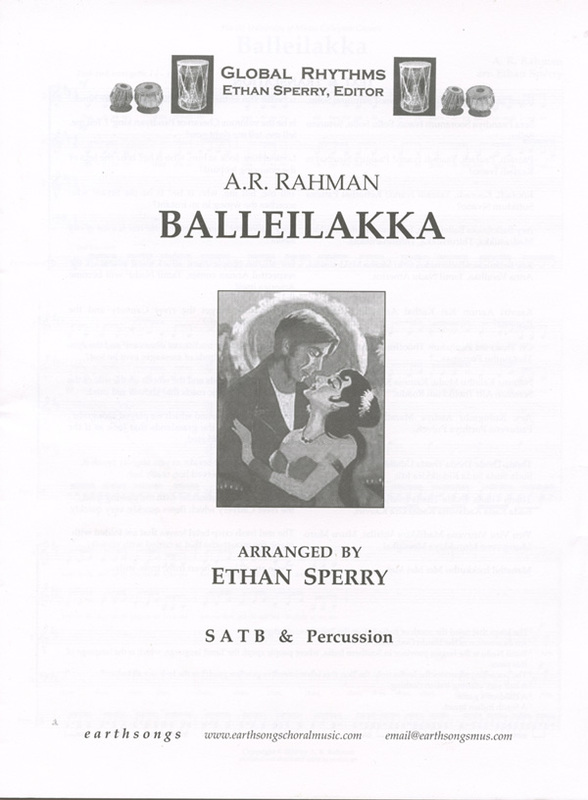 Balleilakka is a song from the Tamil film Sivaji, which means "The Boss." Tamil is the language of the Southern Indian province of Tamil Nadu whose capital, Chennai (Madras under British rule) is India's third-largest city and A.R. Rahman's home. An old language dating back to before 300 B.C., Tamil is the native language of Singapore and Sri Lanka as well as tens of millions of Indians (there are almost 2,000 newspapers in print in Tamil today of which about 350 are daily papers). The text of this piece is a tongue-twister lamenting how traditional Indian culture is being subsumed and listing the speaker's memories of his homeland in increasingly faster syllabic patterns. A beautiful song with a short, but powerfully symbolic text. The Korean is written out as a transliteration making it easy to sing. There is no divisi and a conservative range, inviting choirs of all abilities to enjoy this special piece. A beautiful Korean folk song, this piece has a short, but powerful text symbolic of a farmer's dream for a better life. The transliteration of the Korean makes this text easy to learn. An artistic piano accompaniment lends support and adds its own color to the already colorful melodies--the piece may also be sung a cappella. This beautiful lullaby from the Philippines features an alto solo accompanied by the choir. Chant for a Long Day is inspired by two monophonic chants for women, the Mersiyet from Pakistan, and the "waulking songs" from the island of Barra in the Hebrides. The text is a depiction of perserverance and longevity, a life force out of the distant and unknowable past, balanced for a moment in the present, and then heading for a distand and unknowable future. The words evoke images of physical and spiritual survival common to many cultures, as well as the images of femininity and womanhood that are also shared by peoples from around the world. 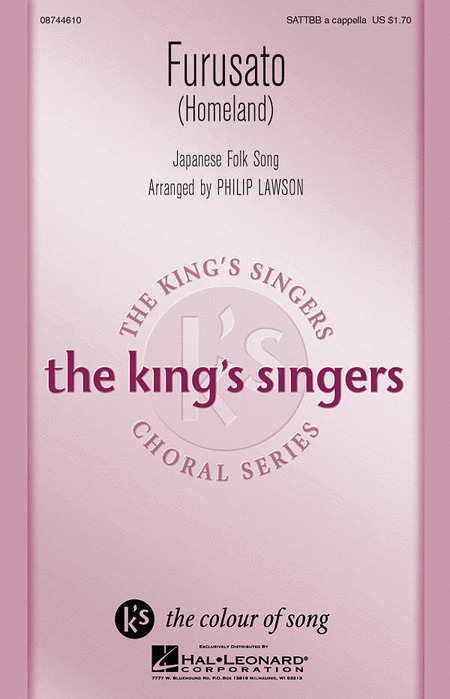 Ideal for introducing part singing, this lovely partner song features a traditional Japanese text paired with an English translation in a setting perfect for spring concerts. 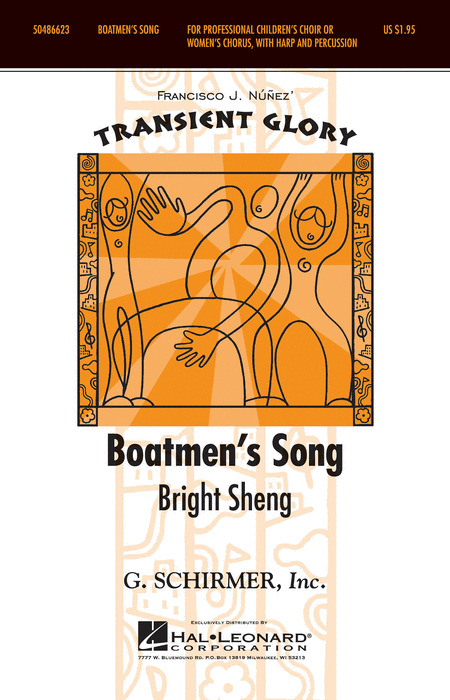 This hauntingly beautiful song will serve as a fantastic festival piece while enhancing your multicultural curriculum. Optional parts for finger cymbals and chime tree enhance the texture, and a pronunciation guide is included. This traditional Visayan folk song comes from a series of islands in the central region of the Philippines. A song of affection, it is sung in the Hiligaynon language (pronunciation guide included). 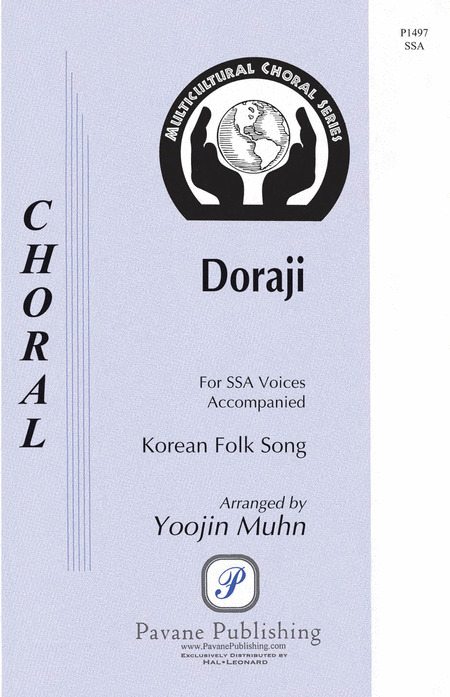 Doraji is one of the most popular Korean folksongs. It is about a wild mountain flower with spiritual essence and this arrangement includes both the gentle beauty of the flower as well as the excitement from those who found it. For treble choirs, this is an excellent multicultural concert selection. This traditional Korean folk song sings about the doraji - a beautiful white wildflower that grows on the shady slopes of Korean mountains. This accessible setting is charming in its simplicity with canon and countermelody and accompanied by flute and bells. Parts for flute and bells included. Duration: ca. 2:20. Weaving together the melodies and texts of three Korean folk songs, Stephen Hatfield has created a seven-minute suite that suggests two contrasting moods of romantic longing - one full of vigor and action, the other more reflective. Scored for high voice and low voice, flute and drum, it can be performed by any combination of voices including SA, TB, or ST/AB. Available separately: 2-part any combination, Instrumental parts (fl, dm). Duration ca. 7:00. Haiku is a Japanese form of poetry comprised of three lines of five, seven, and five syllables. Jerry Estes has crafted a set of four short pieces set to original haiku... one for each season of the year. All are beautiful in their simplicity. 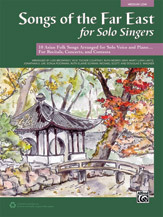 Well suited for Orff accompaniment; bells and rhythm instrument parts are included in the publication. An outstanding learning and performing piece for 2-part choirs. Set to an ancient text that lauds the wonder of Mt. Fuji, composer Childs has created a majestic setting worthy of the glorious mountain and of men's choral groups. A tender tribute to home, this Japanese folk song's sentiment is touching to all. Includes Japanese and English lyrics. "Fuyu No Uta" is a delightful song that children in Japan sing when it is snowing outside. ("Fuyu" means winter.) The text is partly in Japanese, partly in English. The use of wind chimes with the piano provide a light, supportive accompaniment to this fun piece. Based on a popular folk song from the Gujarat region of Northwest India, the voices in this rhythmic folk dance alternate, representing percussion instruments, and the piece also includes suggestions for hand percussion and hand clapping. Accessible while offering harmonic sounds that are fresh and new, this selection introduces a part of the world not often explored with music. For years Jude Roldan has been composing music for the world-famous children's choir that his wife conducts, Hail Mary the Queen Children's Choir. Although often based on sacred words as is common in the Philippines, this is a concert piece. It begins gently but soon breaks into a dynamic and pulsating hallelujah section that is captivating. Treble choirs of all ages, medium difficulty. 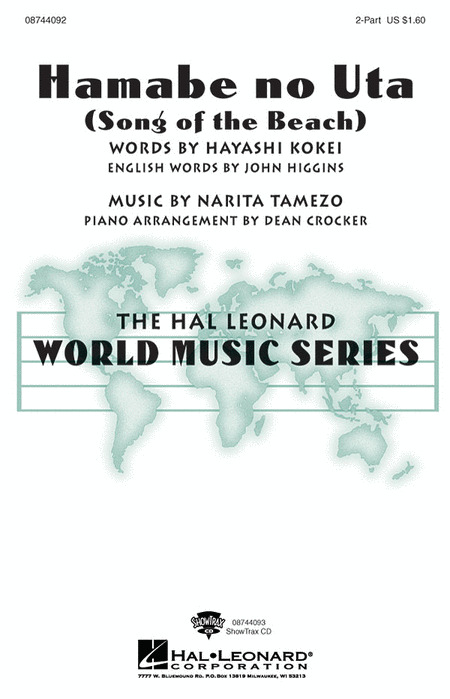 This traditional sounding Song of the Beach has been sung in Japan for over 70 years. The beautiful accompaniment brings to mind the peacefulness of nature described by the lyrics. George Hernandez has been contributing Filipino folk song arrangements to Ron Kean's Multicultural Series with great success. This Christmas folk song continues the tradition with buoyant and tuneful arranging. The choice for accompaniment or a cappella makes this selection work for high school or college choirs. A traditional Japanese children's song, its melody based on the pentatonic scale. The text portrays the wondrous yet simple moments when a lotus flower blossoms and then closes. At a deeper level, the text speaks of the eternal cycle of nature. The music was set to show this eternal cycle by overlapping several layers of melodies to create a mysterious and dream-like atmosphere. The text is Japanese, the pronunciation easy as the vowels are pure as in Italian. A pronunciation guide is provided. In his setting of the ancient Japanese text about the sunlight that fills the sky with the return of spring, Victor Johnson has captured its mystery through haunting melodies and simple harmonies. The added instrumentation offers color and texture as well as framing the English-language middle section. A pronunciation guide is included.